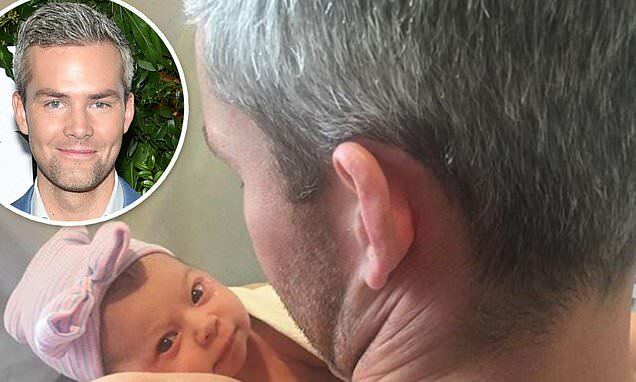 Ryan Serhant has shared a very precious photo from the day he welcomed his first child. The 34-year-old Million Dollar Listing star posed a picture to Instagram on Tuesday showing the moment he did skin-to-skin contact with his newborn Zena. Ryan explained in the caption: 'This was taken at about 6 minutes of life. It’s my favorite photo. The nurses told me to take my shirt off so we could do skin to skin. Ryan and his 33-year-old wife Emilia Bechrakis welcomed Zena on February 26 and have been open about their struggle to conceive. The star revealed on Instagram that the couple had waited for 'almost three years' to meet their daughter before a successful round of in vitro fertilization helped the pair create a family. 'Your momma and I have waited almost 3 years to meet you,' he wrote in a lengthy caption. 'We had no idea how difficult getting pregnant with you was going to be. We tried everything. We were so nervous you might never come. Ryan and Emilia met in 2011 before becoming engaged in September 2015 and tying the knot in grand fashion in Greece on July 7, 2016.